Home > Special Offers > Sales > Get the 2018 Murano Today! 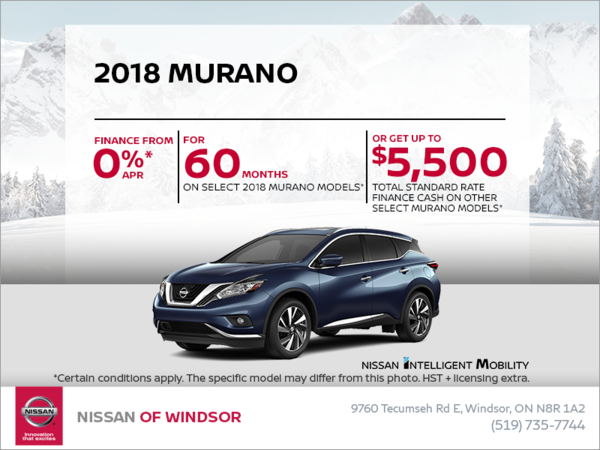 Finance the 2018 Nisan Murano starting from 0% for up to 60 months. OR get up to $5,500 total standard rate finance cash on select models, includes $1,000 AWD cash! Representative finance offer based on a new 2018 Murano S FWD. Selling price is $32,420 financed at 0% APR equals 60 monthly payments of $540 monthly for a 60 month term. $0 down payment required. Cost of borrowing is $0 for a total obligation of $32,420. $1000 Finance Cash included in advertised offers on 2018 Murano S FWD. Standard Rate Finance Cash discount of $5500 will be deducted from the negotiated selling price before taxes and is applicable to customers financing any 2018 Murano platinum through NCF at standard rates. These discounts cannot be combined with lease or finance subvented rates or with any other offer. Certain conditions apply. 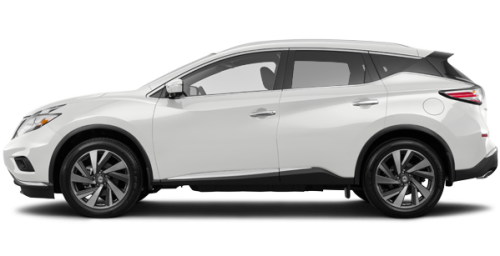 AWD cash of $1,000 (is deducted before taxes) is available on 2018 and 2019 Murano (Excluding FWD) models purchased, leased or financed with NCF and delivered between February 1 - February 28, 2019. Freight and PDE charges $1,795 air-conditioning levy ($100), applicable fees, manufacturer’s rebate and dealer participation where applicable. License, registration, insurance and applicable taxes are extra.